In a search for direct evidence leading to the biological relevance of airway secretions in innate host defense, we characterized the antibacterial function of cationic polypeptides within minimally manipulated nasal fluid. In this study, we show that cationic antimicrobial polypeptides are responsible for most of the bactericidal activity of whole nasal fluid. The removal of cationic polypeptides using a cation-exchange resin ablated the activity of nasal fluid against Escherichia coli, Listeria monocytogenes, and Pseudomonas aeruginosa. By using a novel proteomic approach, we identified a dozen cationic peptides and proteins within nasal fluid, all of which either are known antimicrobial polypeptides or have other proposed roles in host defense. Of the three most abundant cationic polypeptides in nasal fluid, lysozyme was more effective than either lactoferrin or secretory leukoprotease inhibitor in restoring the antibacterial activity of the cationic polypeptide-depleted fluid against a mucoid cystic fibrosis isolate of P. aeruginosa. Airway secretions form a physical and chemical barrier as the first line of host defense against inhaled microbial invaders. Epithelia in the human airways, from the nasal aperture to the alveoli, are covered in a protective film of fluid containing a number of antimicrobial proteins, including lysozyme, lactoferrin, and secretory leukoprotease inhibitor (SLPI)3 (reviewed in Refs. 1 and 2). Lysozyme and lactoferrin are, respectively, the first and second most abundant antimicrobial polypeptides of airway fluid. They are stored in and secreted from serous cells in submucosal glands, and they are also secreted from neutrophils in inflamed secretions. Alone, lysozyme has been found to be bactericidal against some Gram-positive bacteria, but in concert with lactoferrin, it is also bactericidal against some Gram-negative bacteria (3, 4). Another abundant antimicrobial polypeptide in nasal secretions is SLPI, a 11.7-kDa cationic serine protease inhibitor (serpin) originating from the serous cells of the submucosal glands (5, 6). Recent indication is that SLPI has a weak but broad antimicrobial activity against retroviruses (7), Gram-negative and Gram-positive bacteria (8), and fungi (9). Lysozyme has long been presumed to have a significant role in airway host defense due to its in vitro microbicidal activity and ubiquitous, as well as abundant, epithelial expression. Until recently, direct evidence of the biological role of lysozyme has been limited. Akinbi et al. (10) reported that bacterial killing was enhanced in the lungs of mice that transgenically overexpressed rat lysozyme in distal respiratory epithelial cells. The concentration of lysozyme in bronchoalveolar lavage (BAL) from transgenic mice was 2- to 4-fold greater than that of wild-type mice. Mice that overexpressed lysozyme were more efficient than wild-type mice in killing group B streptococci and mucoid Pseudomonas aeruginosa, and had an increased survival rate following infection. In separate studies, slow resolution of hyaline membrane disease-induced bronchopulmonary dysplasia in infants has been found to be associated with reduced production of lysozyme and lactoferrin (11), suggesting a biological role for these molecules in the airways. The smaller antimicrobial peptides are widely distributed molecular effectors of innate immunity. There are several families of peptides that display similar mechanisms of action against microbes. Many peptides are broad-spectrum microbicides that target Gram-positive and Gram-negative bacteria as well as fungi and some enveloped viruses (1, 12, 13). Antimicrobial peptides are cationic and hydrophobic at physiologic pH, attributes that assist peptide binding and insertion into microbial membranes. Some peptides then aggregate to form pores, and death of the microbe occurs once a threshold number of pores have formed (14, 15). In the airways, the antimicrobial peptide human β-defensin (HBD)-1 is constitutively expressed by epithelia at low levels while the related peptide HBD-2 is predominantly induced at sites of inflammation (16, 17). The α-defensin human neutrophil peptide (HNP)-1 (18) has also been found at varying concentrations in BAL (19) and is likely a degranulation product of transudated neutrophils found in infected airways. Anionic antimicrobial (poly)peptides may also contribute to the antimicrobial activity of the airways, and have been detected in ovine and human BAL fluid (20, 21). The abundance and multiplicity of antimicrobial peptides and proteins present in airway secretions suggest that the antimicrobial activity of airway fluid results from the combined effects of many components. In contrast to recent studies that have focused on the antibacterial action of individual components of airway fluids (16, 17, 22, 23), we have developed techniques that enable the analysis of whole, minimally manipulated airway fluid (24). These techniques have afforded us the opportunity to assess the combined antimicrobial activity of multiple components under more physiologic conditions than have been heretofore possible. In this study, we used these techniques to provide evidence that cationic antimicrobial polypeptides are responsible for the majority of antibacterial activity of nasal fluid, because the removal of cationic polypeptides from nasal secretions ablates the ex vivo activity of nasal fluid against Escherichia coli, Listeria monocytogenes, and P. aeruginosa. In reconstitution studies, we showed that the quantitatively most abundant antimicrobial polypeptides (lysozyme, lactoferrin, and SLPI) all contribute to the antibacterial activity of nasal fluid. Human neutrophil lysozyme and human milk lactoferrin were purchased from Sigma-Aldrich (St. Louis, MO). Human rSLPI was purchased from R&D Systems (Minneapolis, MN). HNP-1 was purchased from Bachem (Torrance, CA). rHBD-1 and -2 were produced in our laboratory as previously described (17, 25). Nasal secretions were collected from 16 healthy volunteer donors according to a protocol approved by the University of California, Los Angeles, Institutional Review Board. From most donors, nasal secretions were collected by vacuum-aided suction, without chemical stimulation, to avoid introducing foreign substances into the nasal fluids. Gentle manipulation of a narrow rubber-tipped vacuum device inside the nasal passageways mildly stimulated nasal secretions. The range of secretion volumes collected varied between 100 μl and 1.5 ml, depending on the donor. Nasal secretions were pooled and stored at −20°C. Fluid samples were gamma-irradiated at 20 krad and homogenized briefly using a handheld Sonic Dismembranator 100 (Fisher Scientific, Pittsburgh, PA). As previously reported, storage, sonication, and gamma irradiation did not produce discernable changes in microbicidal activity (24). A cation-exchange resin was used to remove cationic (poly)peptides from minimally manipulated nasal fluid without significantly affecting the concentrations of other major ions. Carboxymethyl weak cation-exchange (CM) resin (Bio-Rad, Hercules, CA) was equilibrated with a buffer, 1× nasal salt buffer (pH 7.4; described in Ref. 24), which approximates the electrolyte composition of nasal fluid. In preparation for the experiment, the equilibrated CM resin was adjusted to pH 6.0, sedimented for 15 min at 10,000 × g, and removed of all overlying 1× NSB. An equal volume of minimally manipulated nasal fluid supernatant was added to the bed volume of 1× NSB-equilibrated CM resin, vortexed briefly, and incubated end-over-end for 48 h at 4°C. Following incubation, the pH of the sample was measured (ranged from 6.8 to 7.0), and the resin was removed by centrifugation (10,000 × g, 10 min). The conductivities of whole (20.8 mS/ml) and CM-depleted (18.5 mS/ml) nasal fluids were measured using a conductivity meter (Oakton, Singapore) in two batches of nasal fluid and found to be quite similar. Cationic peptides bound to the CM resin were extracted by incubating end-over-end with two resin volumes of 5% acetic acid at 4°C for subsequent 2 and 24-h extractions. The peptide extract was vacuum-dried and resuspended to the original volume of nasal fluid. The volume of CM-depleted nasal fluid was equivalent to the starting volume of whole nasal fluid. All samples were frozen at −20°C in aliquots for subsequent experiments. Nasal secretions were separated on duplicate gels by acid urea (AU)-PAGE (25) and Tricine-SDS-PAGE (26). Following AU-PAGE or SDS-PAGE, gels were immunoblotted to Immobilon-PSQ polyvinylidene difluoride (PVDF) membranes (Millipore, Bedford, MA) for 30 min (HBD-1, HBD-2, and HNP-1 to -3), 1 h (lysozyme), 2 h (SLPI), to 4 h (lactoferrin) in 0.7% acetic acid/10% methanol as described previously (25). The membranes were then incubated with either 1/250 dilution of rabbit polyclonal anti-human lysozyme (DAKO, Carpinteria, CA), 1/5000 dilution of anti-human lactoferrin (DAKO), 1/1000 dilution of anti-HBD-1 (25), 1/1000 dilution of anti-HBD-2 (27), or 1/1000 dilution of goat anti-human SLPI (R&D Systems, Minneapolis, MN) overnight at room temperature. After several washings in 1× Blotto TBS (TBS plus 1% dried milk and 0.1% BSA), membranes were incubated with 1/2000 dilution of alkaline phosphatase-conjugated polyclonal goat anti-rabbit (lysozyme, lactoferrin, HBD-1, and HBD-2) secondary Ab (Pierce, Rockford, IL) or rabbit anti-goat (SLPI) secondary Ab (Organon Teknika, West Chester, PA) for 1 h at room temperature. The membranes were washed and then developed using nitroblue tetrazolium/5-bromo-4-chloro-3-indolylphosphate as a chromogenic substrate. Serial dilutions of standard human neutrophil lysozyme (Sigma-Aldrich), human milk lactoferrin (Sigma-Aldrich), SLPI (R&D Systems), HBD-1, and HBD-2 (25, 27) were used as positive controls and for semiquantitative studies. Briefly, 0.5 mg/ml lyophilized Micrococcus lysodeiktikus was suspended in 66 mM sodium phosphate buffer (Na2HPO4/NaH2PO4, pH 7.4), combined with 1% low EEO-agarose in 66 mM sodium phosphate, and poured in a level 9 × 9 cm square petri dish (28). Sixteen or 25 evenly spaced 3.2-mm wells were punched in the solidified agar, and 5 μl of sample was introduced into each well. Lysozyme enzymatic activity was determined by measuring the diameters of zones of clearance relative to standards of human neutrophil lysozyme. The P. aeruginosa strain, designated “CF,” is an isolate (29) from a cystic fibrosis patient and was generously donated by Dr. M. J. Welsh (University of Iowa, Iowa City, IA). P. aeruginosa CF and the laboratory strains E. coli ML-35p and L. monocytogenes EGD were cultured 18 h at 37°C in 50 ml of 3% trypticase soy broth (TSB; strains described in Ref. 30). Each strain was snap-frozen by rapidly freezing aliquots in liquid nitrogen and stored at −80°C for up to 1 year. Aliquots (50 μl for E. coli, 500 μl for all other bacteria) were thawed and subcultured 2.5 h immediately before use in antibacterial assays in 50 ml of 3% TSB to obtain mid-logarithmic growth phase. Subcultures were then centrifuged at 1400 × g for 10 min and washed once in 1× HBSS or 1× NSB. The bacteria were collected at 1400 × g for 10 min, and resuspended in 1–5 ml of HBSS or 1× NSB. An OD625 of 0.16 to 0.18 approximated 2.5 × 107 bacterial CFU/ml. E. coli and L. monocytogenes were selected because of their high sensitivity in screening assays (radial diffusion assays (RDAs)). P. aeruginosa was used in the most biologically relevant model (CFU assay) of ex vivo colonization of nasal fluid. RDAs were performed as described previously (31). Briefly, the underlay consisted of 1% agarose and 1/100 dilution of TSB in 10 mM sodium phosphate (pH 7.4), either alone or supplemented with 50 or 100 mM NaCl. The overlay consisted of 6% TSB and 1% agarose in dH2O for all assays. Bacteria or fungi (4 × 106) were mixed with 10 ml of underlay gel solutions kept molten at 48°C and poured into 100-cm2 square petri dishes. A series of 3.2-mm diameter wells were punched after the agarose solidified, and 5 μl of sample was added into designated wells. Plates were incubated at 37°C for 3 h to allow for peptide diffusion. The microbe-laden underlay was then covered with 10 ml of molten overlay, and the plates were allowed to harden. Antibacterial activity was identified as a clear zone around the well absent of microbial growth after 18-h incubation at 37°C. The activity was represented in radial diffusion units (RDU) defined as: (diameter of clear zone (in millimeters) − 3.2 mm) × 10. Assays were repeated at least twice. The gel-overlay assay measures the activity of peptides and proteins that diffuse from an electrophoresed PAGE gel into an agarose gel embedded with microcolonies of bacteria and was performed as described previously (31). Briefly, nasal fluid was extracted with 5% acetic acid, vacuum-dried, resuspended in 3× loading dye, and separated by AU-PAGE. The gel was washed 20 min in 10 mM sodium phosphate pH 7.4 then placed on a premade 1% agarose plate containing 10 mM sodium phosphate with 100 mM NaCl (pH 7.4), 0.03% (w/v) of TSB powder, and 4 × 106 L. monocytogenes or E. coli. The plate was then incubated at 37°C for 3 h to allow the proteins and peptides in the polyacrylamide gel to diffuse into the underlying bacterial layer. The polyacrylamide gel was then removed, and the bacterial layer was overlaid with a nutrient layer that contained 6% TSB in 1% agarose. Clear zones without bacterial growth represented antibacterial activity. Duplicate AU gels were electrophoresed and Coomassie-stained to correlate antibacterial activity with protein bands. Bacteria (OD625 = 0.2) were diluted 100- to 300-fold in HBSS for use in the CFU microassay (modification of a method described in Ref. 32). Samples consisted of 6 μl of either bacterial or yeast dilution in HBSS/0.2% TSB plus 24 μl of nasal fluid for each condition, which allowed quadruplicates of three time points (0-, 3-, and 24-h incubation). Separate tubes with 6 μl of bacteria or yeast and 24 μl of 1× NSB/0.2% TSB were used as controls for microbial growth. Each well of a 72-well Terasaki microtiter plate (Nalge Nunc International, Roskilde, Denmark) was loaded with 2 μl of liquid wax (MJ Research, Watertown, MA) to prevent evaporation. Two microliters of the sample (or buffer-only control) was loaded into each of 12 wells by pipetting directly underneath the liquid wax. The entire plate was incubated at 37°C/5% CO2. To recover the incubated fluid at the specified time points, wells were washed thoroughly with 46 μl of HBSS and the wash was placed on ice in a microcentrifuge tube. The fluid was then plated on tryptic soy agar plates, and CFUs were counted following overnight incubation at 37°C. Nasal secretions were separated on a 25-cm AU-PAGE gel (12.5% acrylamide/0.33% bis-acrylamide) as the first dimension and transferred to a reducing SDS-PAGE as the second dimension. Nasal fluid (20 μl) was extracted with 200 μl of 5% acetic acid, concentrated to near dryness under vacuum, and resuspended in 20 μl of AU-PAGE loading dye (9 M urea in 5% acetic acid with a few grains of methyl green). The AU-PAGE gel was electrophoresed 16 h under pulsed field (160–170 V forward pulse for 0.1–18 s, reverse pulse for 0.03–6 s; pulses incremented by 2-fold for 10 replications and then reset to shortest time; Programmable Pulse Inverter-200; MJ Research). The gel was stained using 0.1 × amido black (0.04% napthol blue-black, 2.5% isopropanol, and 1% acetic acid) for 10–20 s to visualize protein bands. Strips of AU-PAGE gel, consisting of an entire lane of an AU gel with electrophoresed nasal secretion proteins, was excised and incubated at room temperature in dH2O for 3 min. Subsequent incubations in 50 mM Tris (pH 8.8) were performed for three rinses (15 min per rinse). The gel strip was trimmed and placed atop the cathodal side of a precast 8–18% SDS-PAGE gel (Amersham Pharmacia Biotech, Piscataway, NJ) and electrophoresed for 45 min at 20 mA in a MultiPhor II electrophoresis system (Amersham Pharmacia Biotech) using ExcelGel SDS buffer strips (Amersham Pharmacia Biotech) as ion reservoirs. Once the proteins migrated from the AU-PAGE slice into the SDS-PAGE gel, the buffer strips were repositioned, and the gel was electrophoresed for an additional 145 min at 40 mA. Protein spots were visualized in the gel with either silver stain or SYPRO Ruby Gel (Bio-Rad), or on Immobilon-PSQ PVDF membranes with SYPRO Ruby Blot or Colloidal Gold total protein stain (Bio-Rad) according to the manufacturer’s instructions. N-terminal sequencing was done by automated Edman degradation, in a model Procise-cLC protein sequencer (Applied Biosystems, Foster City, CA), of protein spots excised from large-format (two-dimensional gel) SDS-PAGE transferred to PVDF membranes as described in Ref. 33 . For mass-matching techniques, two-dimensional gels were stained as described above, and each protein spot of interest was excised using a clean razor blade and immersed in 1% acetic acid for storage. Silver-stained cored gel pieces were washed three times with HPLC grade water (Sigma-Aldrich), three times with Farmer’s reducer (30 mM potassium ferricyanide/65 mM sodium thiosulfate) in HPLC grade water, and five to 10 times with HPLC grade water. Cored SYPRO Ruby gel pieces were washed three times with 50% acetonitrile/0.01 M NH4HCO3 and vacuum-dried for 30 min. Sequencing grade trypsin (200–500 ng; Promega, Madison, WI) was mixed with 0.01 M NH4HCO3 (5 μl); the pH was adjusted to 8.5, and in-gel digestion continued for 15 h at 37°C (34). The peptides were extracted with 60% acetonitrile/0.01 M NH4HCO3. The extracted peptides were microdesalted using C18 ZipTip (Millipore), mixed with α-cyano-4-hydroxycinnamic acid (Agilent Technologies, Wilmington, DE), and analyzed by delayed-extraction reflectron matrix-assisted laser desorption ionization-time of flight mass spectrometry using a model ReflexIII mass spectrometer (Bruker Daltonics, Billarica, MA) as described in Ref. 35 . The proteins were tentatively identified by matching the monoisotopic masses of tryptic peptides against the All Taxa proteome using either the ProFound (http://129.85.19.192/profound_bin/WebProFound.exe) or the Mascot (http://www.matrixscience.com/cgi/index.pl?page=/search_form_select.html) algorithms. Bacterial colony counts (CFU assay) and RDAs were performed in at least triplicate in each independent experiment. Statistical analyses were performed on log10 values to enhance normal distribution. Sets of independent experiments were compared with a Tukey pairwise comparison (Sigma-Stat; SPSS, Chicago, IL). Error bars represent SEM. Some of our initial studies, which defined the antimicrobial activity of minimally manipulated nasal secretions, used boiling to heat inactivate nasal secretions (24). Subsequent addition of lysozyme and lactoferrin could not fully restore the activity of the boiled fluid in CFU assays against a mucoid strain of P. aeruginosa, thus implicating other antimicrobials that potentially act in concert with lysozyme and lactoferrin (24). However, the boiling procedure aggregates much of the soluble protein (Fig. 1⇓) and unpredictably alters the macromolecular composition of nasal fluid. Therefore, we sought to develop gentler methods to selectively deplete airway secretions of specific cationic polypeptides, while retaining physiologic concentrations of the remaining polypeptides and electrolytes. Heat inactivation of nasal fluid aggregates peptides and proteins. Whole nasal fluid was heated at 100°C for the specified times, subsequently cooled on ice for 10 min, electrophoresed on AU-PAGE, and silver stained. 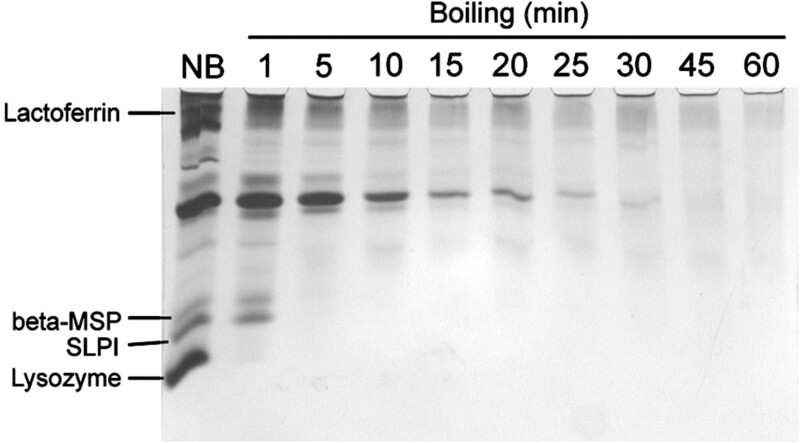 Note that boiling time and loss of stained protein bands were directly correlated, which indicates that the aggregate could not be electrophoresed into the gel. Several major protein bands are marked for reference. The cationic peptides and proteins were extracted from nasal secretions by incubation with the cation-exchange resin, CM-Prep (Bio-Rad), which had been pre-equilibrated with 1× NSB, a buffer that has the electrolyte and divalent cation composition of nasal fluid. Several studies were performed to test the effects of CM depletion. AU-PAGE, which separates polypeptides based on their cationic charge density, was performed on nondepleted and CM-depleted nasal fluid as well as the (poly)peptides recovered from the resin. 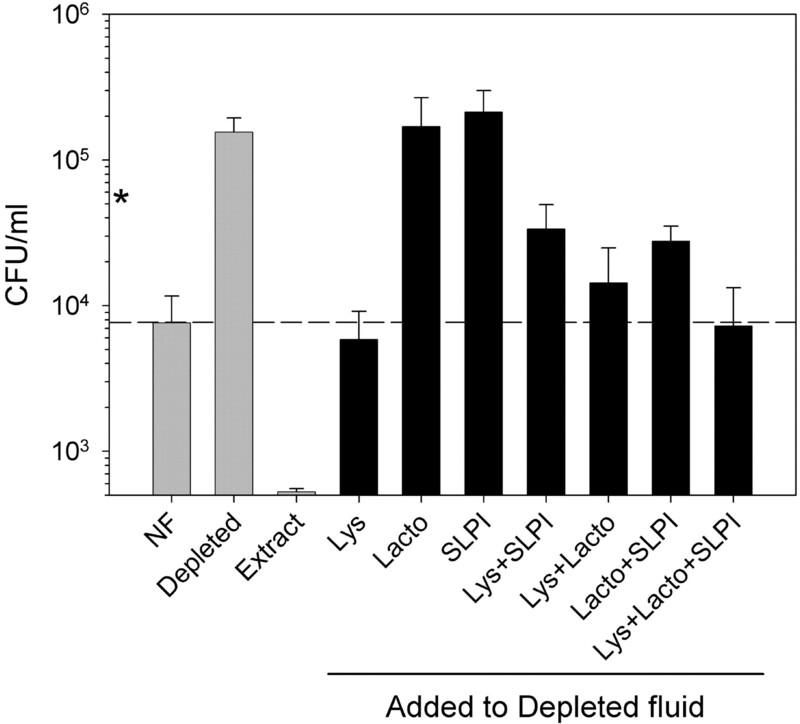 Lysozyme, SLPI, and small amounts of several other cationic polypeptides were depleted from the nasal fluid, while most of the other proteins and peptides remained unchanged (Fig. 2⇓A). As predicted, overlaying an unstained duplicate of this AU-PAGE gel onto a lawn of a test organism, L. monocytogenes, in 10 mM sodium phosphate (pH 7.4) plus 100 mM NaCl revealed an absence of lysozyme-mediated killing only for the CM-depleted nasal fluid (data not shown). Semiquantitative Western analysis revealed that lysozyme was nearly absent from the CM-depleted fluid (Fig. 2⇓B) and that concentrations of other known antimicrobial (poly)peptides were also significantly reduced (Table I⇓). The concentration of lactoferrin was not appreciably diminished in the CM-depleted nasal fluid, which may be related to the low cationic charge density of lactoferrin and reduced binding to CM resin in the physiologic concentration of electrolytes in nasal fluid. Selective depletion of cationic polypeptides from airway fluid. A, AU-PAGE was performed on whole nasal fluid (NF), CM-depleted nasal fluid (D), and cationic polypeptides extract (E). Lysozyme, SLPI, and small amounts of several other cationic polypeptides were depleted from the nasal fluid while most of the other proteins and peptides remained unchanged. B, Semiquantitative Western analysis with mouse anti-human lysozyme mAbs revealed that the concentration of lysozyme removed from D was fully recovered in E. C, The enzymatic activity of lysozyme as measured by lysoplate (upper panel) and the antibacterial activity as measured by RDA against L. monocytogenes in 10 mM sodium phosphate (pH 7.4) (lower panel) are shown for whole nasal fluid, CM-extracted nasal fluid, and cationic peptide extract. By lysoplate analysis, the enzymatic activity of lysozyme was reduced to <0.1% of its nondepleted fluid counterpart (Fig. 2⇑C). Likewise, the corresponding bactericidal activity of CM-depleted nasal fluid was significantly reduced as compared with intact nasal fluid under RDA analysis against our test strains L. monocytogenes (Figs. 2⇑C and 3) and E. coli (data not shown) in low electrolyte conditions (10 mM sodium phosphate, pH 7.4). 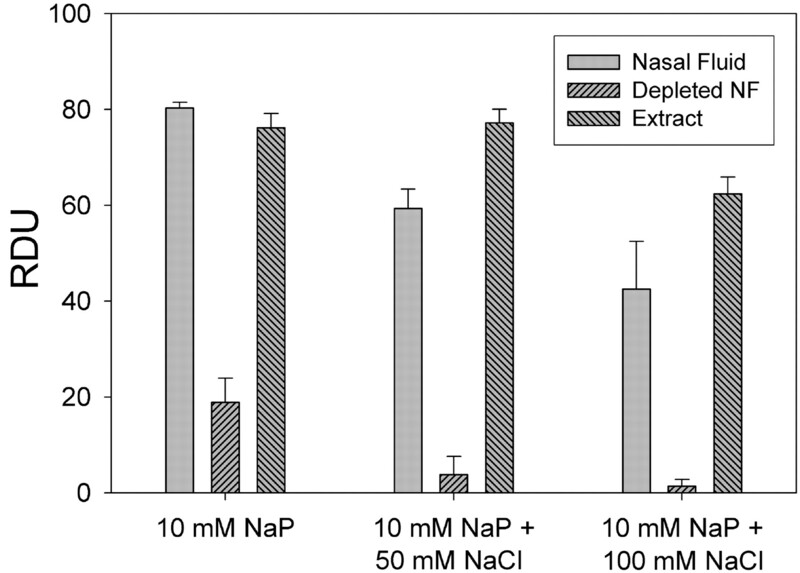 Similar activities were also apparent at higher electrolyte conditions (10 mM sodium phosphate (pH 7.4) supplemented with either 50 mM NaCl or 100 mM NaCl; Fig. 3⇓). Most importantly, for each test condition the cationic polypeptide extract was as active as the whole nasal fluid. Taken together, these data indicate that the antibacterial activity of nasal fluid is contained in the cationic fraction. Whole nasal fluid, CM-depleted fluid, and the extracted cationic polypeptides were used in subsequent electrophoretic and reconstitution assays. Salt sensitivity of CM-depleted and nondepleted nasal fluid in radial diffusion assays. The activity of whole nasal fluid, CM-depleted nasal fluid, and cationic peptide extract was measured by RDA analysis against L. monocytogenes in 10 mM sodium phosphate (pH 7.4) alone or supplemented with 50 mM NaCl or 100 mM NaCl (n = 6). Activity is expressed as RDU. Error bars represent SEM. We used a novel proteomic technique to identify cationic antimicrobial polypeptides in nasal fluid. By using a combination of AU-PAGE and gel overlays against E. coli and L. monocytogenes, we identified a region that contained a number of antimicrobial polypeptides (Fig. 4⇓A). A slice of AU-PAGE gel from the antimicrobial region (the first dimension of a two-dimensional gel) was electrophoresed into an SDS-PAGE gel (the second dimension). The resulting silver-stained two-dimensional electrophoretogram of the antimicrobial region is shown in Fig. 4⇓B with most of the major polypeptide spots in this region identified. Table II⇓ indicates how each polypeptide spot was characterized in this study and summarizes the previously reported biological functions for each identified polypeptide. Note that every polypeptide identified in this region was either previously reported to be antimicrobial or has other purported roles in host defense. Identification of cationic antimicrobial polypeptides in nasal fluid. A, Gel overlay analysis was performed on 5% acetic acid extracts of three representative donors’ whole nasal fluid (D1, D2, and D3) at low (1×) and high (20×) concentration against E. coli and L. monocytogenes. Note that zones of clearance in the bacteria-laden agarose identify putative antimicrobials in nasal fluid and that different proteins are responsible for activity against each microorganism. Bracket indicates region of antibacterial activity within an AU-PAGE gel. B, Two-dimensional gel of the antimicrobial region in A, with AU-PAGE in the first (horizontal) dimension and SDS-PAGE in the second (vertical) dimension. Antimicrobials identified by N-terminal Edman protein sequencing and mass-matching techniques are shown here and described in Table II⇓. The pattern of antibacterial activity by gel overlay analysis was different against L. monocytogenes and E. coli (Fig. 4⇑A). 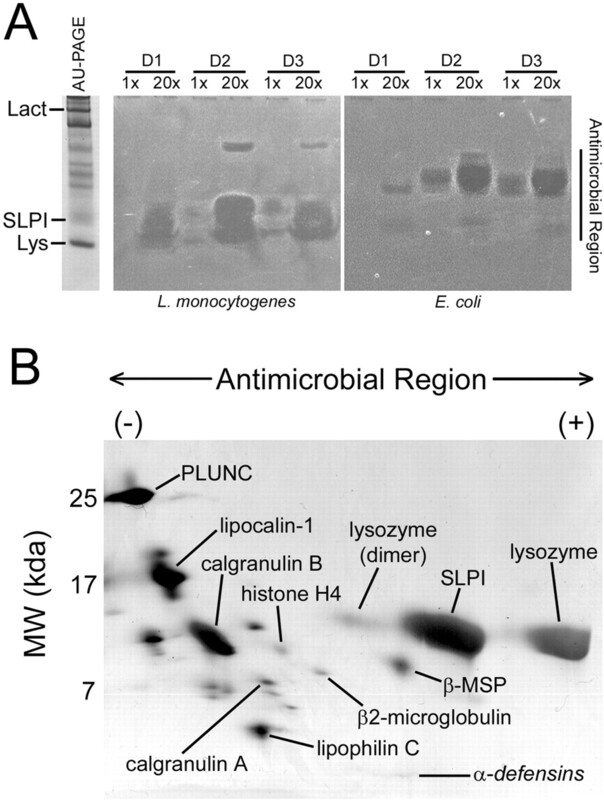 Lysozyme, SLPI, α-defensins, and β-microseminoprotein localized in the region of the gel that was active against L. monocytogenes, while palate lung uvula nasal epithelial clone, lipocalin-1, calgranulins A and B, lipophilin C, and β2-microglobulin localized in the region of the gel that was active against E. coli. Specifically, lysozyme was more active against L. monocytogenes than E. coli in gel overlays (Fig. 4⇑A) and in RDAs (data not shown), which is likely attributed to the ability of lysozyme to digest peptidoglycan that is exposed in Gram-positive, but not Gram-negative, bacteria. Two-dimensional gel electrophoresis was next used to characterize the cationic polypeptides that remained in the nasal fluid after CM depletion, as well as those that were extracted with the CM resin. Representative two-dimensional gel electrophoretograms are given in Fig. 5⇓, revealing the polypeptide spot profile of whole nasal fluid (Fig. 5⇓A), CM-depleted nasal fluid (Fig. 5⇓B), and cationic polypeptide extract (Fig. 5⇓C). The antimicrobial region designated in Fig. 4⇑ is underlined in each panel. Although the concentration of several peptides was slightly diminished in the CM-depleted nasal fluid (Fig. 5⇓B, arrows), there was a complete depletion of lysozyme and SLPI. Two-dimensional gels of the cationic polypeptide extract (Fig. 5⇓C) indicated that only lysozyme, SLPI, and lactoferrin were recovered. Taken together with Figs. 2⇑ and 3⇑, this implies that lysozyme, SLPI, and lactoferrin contribute most of the antibacterial activity of nasal fluid. The next set of experiments explores reconstitution of CM-depleted fluid with these three cationic polypeptides. Two-dimensional analysis of whole and depleted nasal fluid. Two-dimensional gel electrophoresis was performed on whole nasal fluid (A), CM-depleted nasal fluid (B), and cationic polypeptide extract (C), in which AU-PAGE was electrophoresed in the horizontal dimension (cathodal region on right of panel) and SDS-PAGE was electrophoresed in the vertical dimension. The antimicrobial region, as described in Fig. 4⇑, is underlined. Although the concentration of several peptides within the antimicrobial region was diminished, note the absence of lysozyme and SLPI as shown in the oval-outlined region of B. Both lysozyme and SLPI were recovered in the cationic peptide extract (C). Note the higher proportion of lysozyme found in the dimerized state in the first dimension (AU-PAGE), a processing artifact present after extraction from the CM resin. Arrows indicate polypeptides that were partially depleted from nasal fluid but not recovered in the cationic extract. The ex vivo antibacterial activity of CM-depleted fluid was tested in the presence or absence of physiologic concentrations of lysozyme, SLPI, and lactoferrin (either alone or in combination) in CFU assays against a mucoid strain of P. aeruginosa isolated from a patient with cystic fibrosis. To determine the “physiologic” amount of polypeptide for these restoration assays, the concentration of lysozyme, SLPI, and lactoferrin was measured by Western blot for whole nasal fluid and CM-depleted fluid, and the difference in concentration was added back to the CM-depleted fluid. Fig. 6⇓ reveals that, although whole nasal fluid was able to reduce the CFU per milliliter by nearly 10-fold after 3-h incubation, the number of CFU per milliliter within CM-depleted fluid increased ∼5-fold over inoculum and was significantly different from whole nasal fluid (n = 6; p < 0.002). The CFU per milliliter of whole nasal fluid and the cationic polypeptide extract at 3 h were not significantly different (n = 6; p = 0.245). Lysozyme alone is sufficient to restore the antibacterial activity of CM-depleted nasal fluid in CFU assays against P. aeruginosa. CFU assays against P. aeruginosa CF were performed on whole nasal fluid (NF), CM-depleted nasal fluid, cationic peptide extract, and CM-depleted nasal fluid restored with physiological concentrations of lysozyme (Lys) alone or in combination with lactoferrin (Lacto) and/or SLPI. The average inoculum is indicated by an asterisk. Surprisingly, the addition of physiologic concentrations of lysozyme was sufficient to restore the activity of CM-depleted nasal fluid. Indeed, the antibacterial activity of CM-depleted nasal fluid supplemented with either lysozyme alone, lysozyme plus SLPI, lysozyme plus lactoferrin, lactoferrin plus SLPI, or lysozyme plus SLPI plus lactoferrin was not statistically different from that of whole nasal fluid (n = 4–6, p ≫ 0.05), comparing CFU per milliliter at 3 h postinoculum. There was significantly more growth of CFU per milliliter at 3 h with the addition of lactoferrin alone (n = 4; p = 0.013) or SLPI alone (n = 4; p = 0.003) as compared with whole nasal fluid (n = 6). An elegant study by Singh et al. (36) revealed that, although physiologic concentrations of lactoferrin do not affect the growth rate of free-swimming P. aeruginosa, lactoferrin prevents biofilm development by P. aeruginosa. This may account for the inability of lactoferrin alone to reconstitute the bactericidal activity of CM-depleted nasal fluid. CM-depleted nasal fluid supplemented with lysozyme alone (n = 4, p < 0.001), lysozyme plus lactoferrin (n = 4, p = 0.021), or lysozyme plus lactoferrin plus SLPI (n = 4, p = 0.002) could significantly reduce CFU per milliliter as compared with CM-depleted nasal fluid. RDAs against E. coli and L. monocytogenes confirmed that lysozyme alone or in combination with SLPI and/or lactoferrin restored the activity of CM-depleted nasal fluid (data not shown). These data suggest that lysozyme, either alone or in combination with lactoferrin and SLPI, is responsible for a majority of the antibacterial potential of nasal fluid. In a search for direct evidence leading to the biological relevance of airway secretions in host defense, we characterized the antibacterial function of cationic polypeptides in minimally manipulated nasal fluid. Previous studies by our group (24) and others (2, 4, 37, 38) revealed that airway secretions contain a number of antimicrobial polypeptides. However, until now, the contribution of these and other proteins to innate host defense of the airways had not been examined in the appropriate biological context. The current study reveals that 1) cationic antimicrobial polypeptides are responsible for the antibacterial activity of whole nasal fluid, 2) removal of cationic polypeptides from nasal secretions ablates ex vivo activity against E. coli, L. monocytogenes, and P. aeruginosa, and 3) only the quantitatively most abundant cationic polypeptides (lysozyme, lactoferrin, and SLPI) contribute measurably to the bactericidal activity of nasal fluid. Although one-dimensional electrophoretic techniques revealed the major antimicrobial components within nasal fluid, such as lysozyme and SLPI, the resolving power of these gels is not sufficient for the identification of other putative antimicrobial polypeptides. To overcome these limitations, we turned to two-dimensional electrophoresis to help characterize the proteome of nasal fluid, specifically focusing on cationic polypeptides. Standard techniques use isoelectric focusing of protein samples in the first dimension, followed by SDS-PAGE in the second dimension. The resulting protein spots can be visualized by a variety of staining techniques, excised from the gel, and sequenced by mass-matching techniques or N-terminal Edman degradation. However, these standard techniques proved problematic in our system because many antimicrobial peptides and proteins are extremely cationic and are not resolved by conventional isoelectric focusing methods, resulting in the loss of all polypeptides whose isolelectric point is >9 (data not shown). This includes such common antimicrobial substances as lysozyme, lactoferrin, defensins, and many other cationic antimicrobial (poly)peptides. For this reason, we adopted a two-dimensional gel system that resolves proteins by cationic charge to mass ratio in the first dimension using AU-PAGE and molecular mass in the second dimension using SDS-PAGE. Although the first-dimension AU-PAGE revealed putative proteins other than lysozyme, lactoferrin, and SLPI in the cationic polypeptide extract (Fig. 2⇑A), these were not noted in the two-dimensional gels (Fig. 5⇑C) and may represent proteins with posttranslational modifications (e.g., glycosylation) that are not easily resolved by SDS-PAGE. We also noted that protein bands, which appear as a single bands by AU-PAGE, may separate into two or more protein spots in the second-dimension SDS-PAGE. We are currently purifying several of these polypeptides from large volumes of whole nasal fluid, and will use the purified polypeptides in reconstitution assays against a wide range of target microbes. Our studies (Table I⇑ and Ref. 24), as well as those from other groups (2, 4, 37, 38), indicate that the predominant antimicrobial polypeptides within nasal fluid are lysozyme, lactoferrin, and SLPI. However, we have also identified a number of additional antimicrobial (and putatively antimicrobial) polypeptides within nasal fluid. One might question why humans have retained such high concentrations of several antimicrobial polypeptides, or what the necessity is for the production of numerous, yet quantitatively less abundant, microbicidal peptides and proteins. One conjecture is that antimicrobial polypeptides have evolved different but partially overlapping spectra of activity. If this is correct, microbes that are resistant to one type of peptide or protein might still preserve sensitivity to another. Likewise, microbes encountering a variety of antimicrobials would be less likely to develop resistance or to otherwise subvert the host’s defenses. A convincing example of differential antimicrobial activity has been reported for β-defensins. Staphylococcus aureus is markedly insensitive to HBD-1 and HBD-2, yet even multidrug-resistant strains are susceptible to a similar molecule, HBD-3 (39). 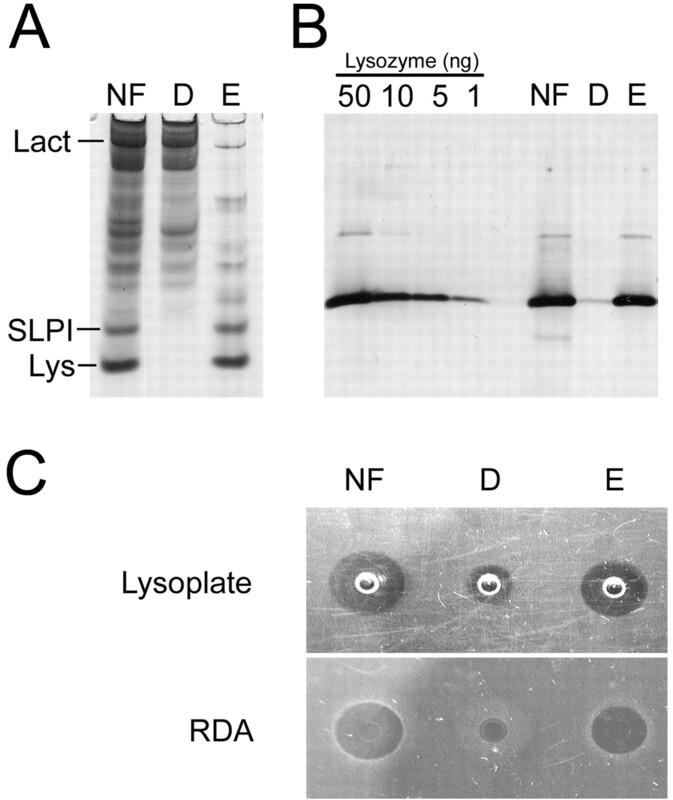 Although it is too early to speculate that the combination of lysozyme, lactoferrin, and SLPI is responsible for innate airway host defense against all potential pathogens, our studies serve as a template for future investigation as to the role of quantitatively less abundant antimicrobial peptides, such as defensins, in the presence and absence of the major microbicidal components of airway fluid. We thank Yong-Hwan Kim, Samuel Tahk, and Lan Lin for their expert technical assistance; Lide Liu, Erika Valore, and Jennifer Ogren for producing recombinant defensins and antisera; and Edith Porter for helpful discussions. ↵1 This work was supported by Grants HL70876 (to A.M.C.) and AI48167 (to T.G.) from the National Institutes of Health, a research training grant from the American Lung Association (to A.M.C. ), and grants from the Cystic Fibrosis Foundation and Cystic Fibrosis Research (to T.G. and A.M.C.). Emory Microchemical Facility is supported by National Institutes of Health-National Center for Research Resources Grants 02878, 12878, 13948, and 016692. ↵3 Abbreviations used in this paper: SLPI, secretory leukoprotease inhibitor; BAL, bronchoalveolar lavage; HBD, human β-defensin; HNP, human neutrophil peptide; AU, acid urea; PVDF, polyvinylidene difluoride; RDA, radial diffusion assay; RDU, radial diffusion unit; CM, carboxymethyl weak cation exchange. Lehrer, R. I., C. L. Bevins, T. Ganz. 1999. Defensins and other antimicrobial peptides. P. L. Ogra, and J. Mestecky, and M. E. Lamm, and W. Strober, and J. Bienenstock, and J. R. McGhee, eds. Mucosal Immunology 89 Academic, San Diego.